Diffuse toxic goiter (synonym: graves ' disease, thyrotoxicosis) - a disease caused by an overactive thyroid gland with excessive blood gets her hormones - thyroxine and triiodothyronine. In the etiology of diffuse toxic goiter have the meaning: 1) mental trauma, 2) organic lesions of the Central nervous system injury, encephalitis and other), 3) acute or chronic infection (influenza, tonsillitis and others), 4) the disease sexual glands, pituitary gland, and other Some importance hereditary factors. Increased production of thyroid hormones occurs most often due to stimulation of activity of the thyroid gland thyroid-stimulating hormone from the pituitary. Excessive intake of thyroid hormones in the blood leads to increased metabolic rate, the expansion of peripheral vessels, disturbances of hemodynamics, reduction in the body's energy supply, ensuring the normal functioning of cells of various organs. The autopsy determined diffuse hyperplasia of parenchymatous elements cancer and vasodilatation; in nodular goiter - multiple nodular growth of the parenchyma of the thyroid gland. Complaint: palpitations, irritability, tearfulness, poor sleep, sudden weakness, weight loss, tremor hands, menstrual disorders, decrease in sexual function, sometimes diarrhea. Objective examination - the power is reduced (appetite usually increased), leather high humidity, the body temperature is subfebrile. 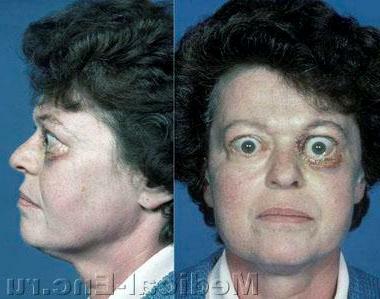 For the clinical picture is characterized by a triad of symptoms: exophthalmia, goiter, palpitations. Advanced eye slit, protruding eyes (exophthalmia, or exophthalmos, usually bilateral and rare flashing give the face with an expression of fear. The degree of increase of the thyroid gland can be different and it is classified according to the international scale (see Goiter). Remember about the possibility of a thoracal location of goiter. Changes in the cardiovascular system: tachycardia, arrythmia, fibrillation, the heart is enlarged left ventricle; on top are heard clapping I tone, and systolic murmur. The course may be slowly progressive or sharp, rough. On the severity of the clinical picture emit light, moderate and severe forms. Complications - heart damage, the liver, gastrointestinal tract, thyroid coma (see). Diagnosis in cases of severe clinical picture (diffuse goiter, persistent tachycardia, weight loss with increased appetite, exophthalmia, small trembling of the fingers) is no problem. In difficult diagnostic cases examine the main exchange, the sample with thyroid uptake of radioactive isotope of iodine I131 (see Thyroid gland). Forecast - timely initiation of treatment leads to recovery; infection, trauma can drastically worsen the case. Treatments: antithyroid tools and surgical intervention. In milder forms of the disease appointed iodine preparations in small doses, inhibiting thyroid-stimulating activity of the pituitary gland and the synthesis of thyroid hormones. Diyodtirosina to 0.05 g 2-3 times a day appointed in the form of courses on 10-20 days with intervals of 5-10 days. Sometimes used logoiski solution in the dose of 15 drops (start with 1 drop and daily adding 1 drop, bring to 15 drops 3 times a day after meals in the form of 3-6 courses at intervals of 10-20 days. Iodine preparations have weak tireostaticeski effect. Currently widespread tireostaticeski preparations - derivatives of thiourea (thiuragyl), antifungals (merkazolil), blocking the synthesis of thyroid hormones. The greatest efficiency has merkazolil. Indicative dose mild form of the disease on 10-20 mg per day, with the disease of moderate and severe on 20-40 mg per day, sometimes more. Treatment antithyroid drugs individual and should be under the weekly monitoring of white blood. The course of treatment 6-12 months. and more. If antitireoidnye drugs have no positive actions that make use of radioactive iodine (I131) or surgical treatment. Surgical treatment is indicated in case of failure of conservative treatment, presence of nodular or running diffuse toxic goiter. In the complex treatment of patients with diffuse toxic goiter used bromides, reserpine, heart drugs, vitamins, anabolic steroids (see). Treatment of thyroid coma - see Coma. The nutrition of patients with diffuse toxic goiter should be high-calorie, diverse, rich in carbohydrates and vitamins. The amount of protein in the diet should be somewhat limited. Treatment on resorts of Crimea and Caucasus are allowed in the cooler months, after elimination of the main symptoms of the disease. In children diffuse toxic goitre more common among girls ages 11 -15 years. The etiology is unclear. Some importance hereditary factor, infection (sore throat, rheumatic fever, flu), mental trauma. Symptoms of the disease is the same as in adults. Treatment for mild and moderate forms usually first conservative. Assign microdose iodine (Iodi puri 0,01; Kalii iodati 0,1; Extr. Valerianae 2,0; Extr. et pulv. Liquiritiae q. 's. ut f. pil. № 40) no 1 pill, 2 times a day course for 20 days with breaks 10 days. Diyodtirosina prescribed in a dose of 0.05 g 2 times a day for 20 days. Children aged 5-7 years of diyodtirosina give in half dose. Shows the simultaneous appointment rezerpina to 0.0001 g 2-3 times a day. You should free the child from the additional loads and to provide adequate nutrition. If indicated - removal of tonsils. When conservative treatment is surgery.